Module 3 of The School for Change Agents looked at a new set of Three Rs - Resistance, Reactance, and Resilience. It was another module full of energy, with our community (as ever) generously sharing their experiences and sharing ideas. Most of us know about resistance when trying to influence change. Resistance usually happens because the people who will be affected by the change feel 'done to'. A way to avoid resistance is to involve people from the very beginning, asking them to invest in the change by influencing the early decisions and directing the flow of the change. But what if - asked Helen Bevan - those people aren't being resistant? What if they are instead showing reactance? There is an experiment by researchers Pennebaker and Sanders. They put two signs on college bathroom walls, one saying "Do not write on these walls under any circumstances", and another saying "Please don't write on these walls." After two weeks, what do you think happened? The first wall was adorned with graffiti. The students were demonstrating reactance - doing the exact opposite of what they were told to do. The key word there is told . So how do we counter reactance? It's fairly simple: reframe our thinking. Ask, don't tell. Be curious. Talk to people. Treat people like the grown-ups they are, able to make decisions for themselves. You can read more about reactance and how to avoid it in the slides - and to me, it brought to mind Transactional Analysis. Actions that cause reactance will tend to be Parent-Child - "I've told you", complete with wagging finger! On the other hand, if our interactions are more Adult-Adult - respectful, considerate - giving people permission to go and do stuff - you are likely to get further, sooner. Resilience is something we need to build into our day-to-day lives. Life can throw us curveballs, and we need to know how to pick ourselves up and move forwards. In other words, we need to cultivate grit, or the ability to persevere and develop our passion over time - Angela Duckworth's book on the subject is a brilliant read. When leading or being involved in change, we need to build our resilience more than ever... delivering change takes time, and can be exhausting. Too often we find our limits the hard way! Remember life isn't a test of who is toughest - we need to be able to take care of ourselves, and one another. It's about how you recharge, not how you endure. 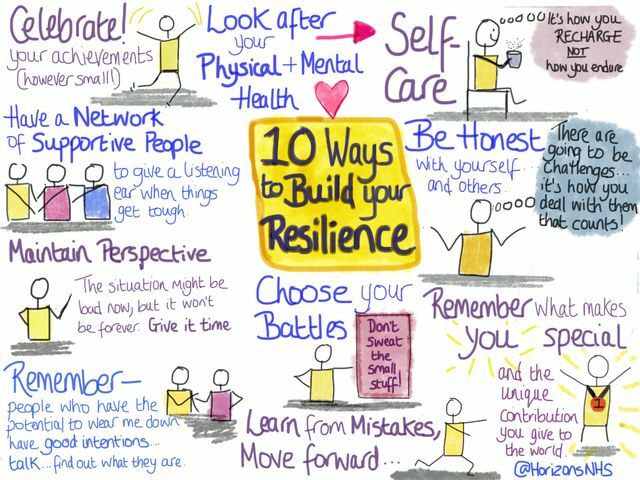 My sketchnote (below) gives some self-explanatory tips about how to build your own resilience - and there's some of my personal tips in this post. I liked Kathryn's thoughts during yesterday's webinar about how as leaders (whether formal or informal) we can use the prompts in this sketchnote to look after other people as well as ourselves. For example, you can be honest and open in acknowledging life isn't going to be perfect, there will be pitfalls along the way - it's how you deal with them that counts. Or you can give people permission and space to try new things - and if things go wrong help them to learn from the mistakes and move on. And when they achieve something - however small - acknowledge it, give praise, help them celebrate! You can also make sure your team members are able to prioritise their mental and physical health by enabling them to do whatever helps them to recharge. Module 4 of The School for Change Agents - From Me to We: Mobilising and Organising will launch on Thursday 8 March at 3pm (UK time). Everyone is welcome! Resilience is about how you recharge, not how you endure. What's Your Return on Social Media Influence?